Since 1950, this residence has been turning out some of Bishop’s most brilliant – and legendary – students. It is connected to Pollack through the 2nd floor, enabling residents to enjoy the use of common areas and laundry facilities in both buildings. Norton overlooks the historic Quad and is the closest residence to the university centre and most of the academic buildings. It is known for its spirit, camaraderie, and pride. 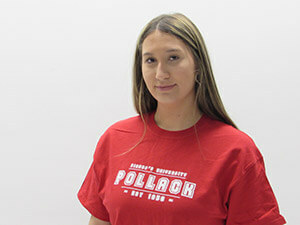 Pollack is a mere hop, skip, and a jump from the Library (a vital fact to tell your parents). It’s the smallest residence on campus, housing 46 residents primarily on two floors. Attached to Norton by the second floor corridor, residents are able to use the common areas and laundry facilities of both buildings. 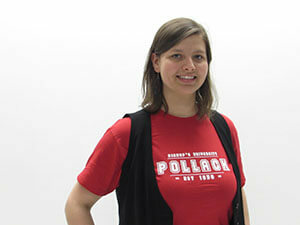 What Pollack lacks in size, it makes up for in friendliness and warmth. Welcome to a unique and dynamic place to live! Each of the RAs from Norton/Pollack has written a bio to welcome students. If you have any questions, please email the RA for your section. 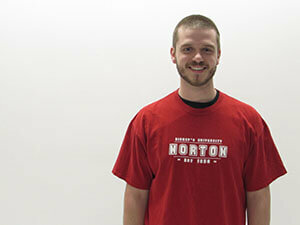 My name is Tom and I’m the Team Coordinator for Norton and Pollack aka NoPo. This will be my third year on the Rez life team, I have loved every moment of it and am looking forward to another amazing year. I’m also in my last year of Computer Science with a minor in entrepreneurship. This will be my first year in NoPo, so I am looking forward to the type of environment we can build together. My team and I are dedicated to providing you with the best on campus experience possible, so please don’t hesitate to email me at TJORDAN15@UBishops.ca if you have any questions. My name is Isabelle (many people call me Izzy, you can take your pick) and I’m thrilled to be your Norton-Pollack SRA for 2018-19! I’m Albertan-Québécoise and am in my third year in Biology: Health Sciences. I love to travel. During my gap “two-years,” I travelled to Australia and tried many different things. From there, I flew up to Thailand to volunteer teach and did a stint in Myanmar. I strongly believe in the importance of doing our part in contributing to the world community, and I’ve chosen to do so by raising funds by participating in a head-shaving event for Kids Cancer Care, volunteering with Rotary International, and by cycling through the Maritimes by myself for the Syrian Refugee Crisis, and also by donating blood. You can try donating and even find out your blood type at one of our biannual blood drives. 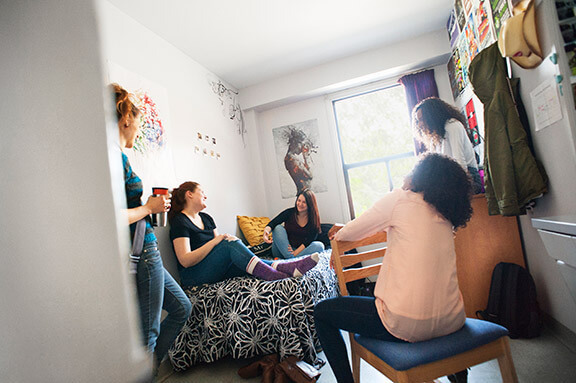 In my first year, I was on the Women’s Rugby Team, but since I began my second year I have enjoyed committing myself to assuring a high-quality residence life. You will often find me chatting away with people at Dewie’s—one of my favourite pastimes! (I worked there during my first year, so if you need any help navigating your new dining service, I would love to show you the ropes) You’ll see that the staff there are super friendly and ready to accommodate your needs. I’m keen on adventures, and I think if you’ve chosen Bishop’s, you’re about to embark on a good one. I very much look forward to meeting and getting to know you in the fall. If you want to chat about travel in foreign lands, travelling alone as a woman or man, or if you wouldn’t mind sharing some of your epic adventure stories with me, please swing by! Finally, if you have any questions or would like to introduce yourself, pop me off an email at iaudet16@ubishops.ca. Hey guys, my name is Victoria and I will be the second floor RA in Norton for the 2018-2019 year! I’m from Ottawa, Ontario and I’m currently in my second year studying Business with a major in Accounting and a minor Sports Studies. Last year, I was living in Mackinnon but I am super excited to be a part of the Norton/Pollack family! A few things about me, I love travelling! I’ve been to over 12 countries, from cruising through the Caribbean and Alaska to backpacking through Europe. Travelling is a huge part of my life that has definitely helped shape me into the person I am today! As well, I grew up playing lacrosse, rugby and competitive Highland Dance! BU has so much to offer and I’m so excited for you all to experience it! I hope you love it here as much as I do! If you have any questions, suggestions or comments for next year or would just like to say hi, don’t be shy to send me an email! Vmcintosh17@ubishops.ca. I look forward to meeting you all next September! Hello Gaiters! 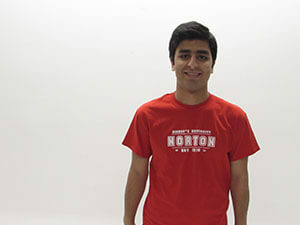 My name is Saad and I am an RA on the Norton and Pollack team. You can greet me with a casual Suh-Dude which, I learnt in my first year, is also a pretty cool way of getting my name right. I was born and raised in a bustling metropolis of Pakistan called Karachi and it holds a special place in my heart. 2018-19 will be my second year at Bishop’s and I’m studying International Studies, History and French. I follow the sports less-watched (Formula 1, Tennis) and am an ardent fan of everything Elon Musk. I love travelling and indulging in all kinds of food except when it’s Asian food for breakfast for 3 days straight (there is a story there). I like to read whenever I can and enjoy music (you will see me with my Bose headphones 95% of the time). I came across Bishop’s in an article titled “Canada’s Best-Kept Secret University” and I was sold. Bishop’s community is this big sea of purple chaos that is helpful, vibrant and beyond approachable in terms of guidance and friendliness. My first Christmas break home from Bishop’s, I was having coffee with one of my professors in Toronto. The praise of Bishop’s community goes beyond the anecdotes that are told in admitted-student receptions and this is where you start living them. Enjoy your first year, make yourself useful, help others, get some studying in and you might just look back on the best year of your academic life. My email is Mbaig17@ubishops.ca (for any query you could think of) and I look forward to interacting with every one of you in September. My name is Megan, but most call me Meg or Megz. I am thrilled to be on the 2018-2019 NoPo RA team and am delighted to meet and get to know you all over the upcoming year. NoPo distinguishes itself by its proximity to both academic buildings and our newly-renovated library. Its traditional style sparks its social environment, which contributes to the “school-friends” dynamic and balance it entails. NoPo transcends Bishop’s University’s sense of community, school spirit and campus convenience. I genuinely enjoy studying at BU because it provides its students with a tailored education while allowing them to expand their horizons by offering a panoply of extracurricular activities and events. Regardless of your interest, we have a club that caters to it and permits you to easily forge friendships along the way. 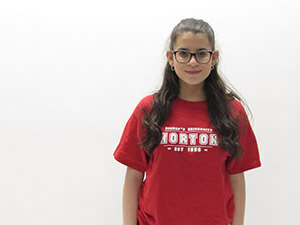 As for me, I am originally from Montreal and will be enrolling in my second year of biological studies in health sciences. I am a huge bookworm so if you are looking for a good read, I’m your girl! You will most likely find me around campus buried in a book, either for school or leisure, listening to music or roaming around chatting with friends. I have developed great organizational skills and so I am more than happy to help you create a balanced schedule, especially considering that the high school/CEGEP to university transition is often overwhelming. I aim to ease that changeover and build a healthy, comfortable, safe and inclusive environment for you to flourish in while showing you the ropes to Bishop’s and helping you learn about yourself. I am open to all of your potential concerns and ideas; I am only a knock away! I look forward to move-in day and in the meantime, warmly welcome you to inquire about RezLife at the following email: MCIPRO17@ubishops.ca.